Fraess worked with one of his friends, who is a Lego enthusiast, to develop a customized wheelchair for the injured eastern box turtle. Photo: Maryland Zoo. 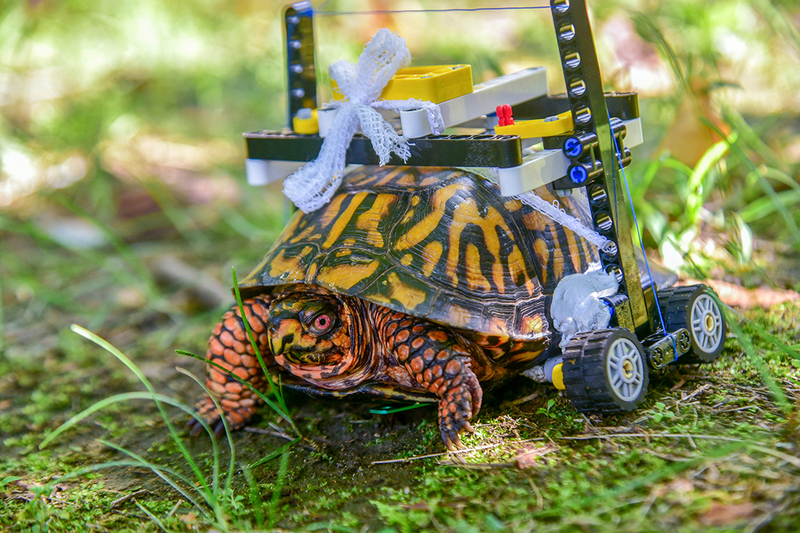 A wild eastern box turtle at the Maryland Zoo in Baltimore, Md., is on the mend and on the move — thanks to some plastic Lego bricks and some clever thinking by Garrett Fraess, a veterinary student from the Western College of Veterinary Medicine (WCVM). Garrett Fraess of St. Albert, Alta. 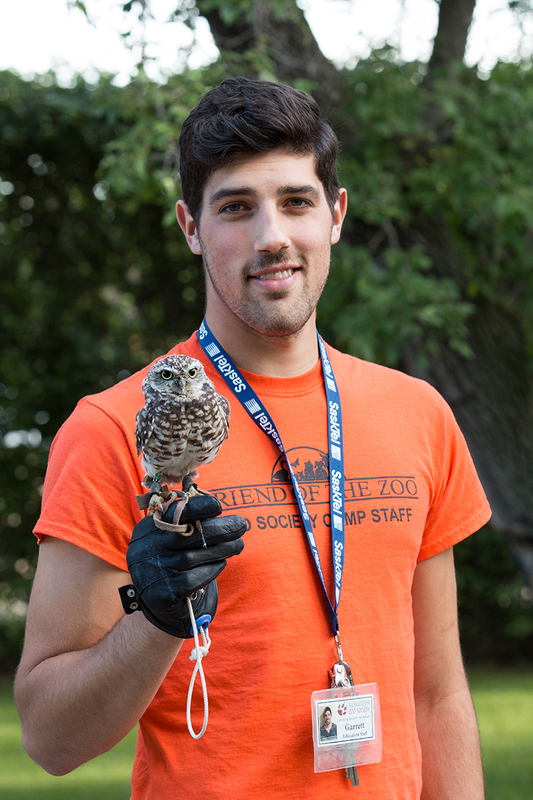 In 2016, Fraess worked as a summer interpreter for the Saskatoon Zoo Society at the Saskatoon Forestry Farm Park and Zoo. Photo: Caitlin Taylor. In July, a zoo employee found an injured turtle in Druid Hill Park and brought it to the zoo’s hospital for treatment. “He had multiple fractures on his plastron, the bottom part of his shell. Because of the unique placement of the fractures, we faced a difficult challenge with maintaining the turtle’s mobility while allowing him to heal properly,” says Dr. Ellen Bronson, senior director of animal health, conservation and research at the Maryland Zoo. Then the team asked Fraess to come up with a way of keeping the bottom of the shell off the ground so it could heal properly. At the time, the veterinary student was at the Maryland Zoo for a veterinary externship — part of his fourth-year clinical training at the WCVM. “They don’t make turtle-sized wheelchairs. So, we drew some sketches of a customized wheelchair and I sent them to a friend who is a Lego enthusiast,” says Fraess, who grew up in Sherwood Park, Alta. Fraess's friend, who lives in Denmark, worked with his sketches and eventually sent some pieces from her own Lego collection to help with the wheelchair design. Just a few weeks after surgery, the turtle received his very own multi-coloured plastic brick wheelchair. Roughly the size of a grapefruit, the turtle sits on four plastic wheels with its shell surrounded by the small Lego frame. Plumber’s putty attaches the device to the edges of the turtle’s upper shell, which gets him off the ground and allows his legs to be freed up so he can move. With the strength of his front legs, the turtle uses his unique transportation to move around inside and outside. The design allows him to exhibit natural behaviours, such as fully closing his shell if he feels threatened. “Turtles heal much slower than mammals and birds, since their metabolism is slower. So, this turtle will likely use his wheelchair through the winter and into the spring until all of the fragments have fused together and the shell has completely healed,” says Bronson. "He's a pretty easy keeper, so it's fun to have him around in the hospital," says Fraess. Since 1996, the zoo has led a Druid Hill Park eastern box turtle monitoring project. To date, 132 wild turtles have been recorded, tagged and released. The project helps the conservation staff to get a better idea how a native Maryland species is thriving in an urban park setting, and it sheds light on turtle territory ranges and behaviours in this rapidly declining species. Video and turtle images courtesy of Maryland Zoo. Injured turtle on a roll with Lego wheelchair from WCVMToday on Vimeo. Article re-posted on 2-Apr-2019 5:07:12 PM .